It was a day like any other, I was browsing the upcoming section of the eShop, looking for the next hidden gem that I can hopefully write about. It was then that I stumbled upon Patobox. With the black and white art style and the punch-out gameplay I was immediately interested and the pre-order discount definitely pushed me over the edge to purchase the game. I didn’t expect to be able to play Patobox that day, especially because games don’t usually release on Mondays. I was expecting to play for a short while before going back to Crash, but I wasn’t prepared for the gem I was about to play. 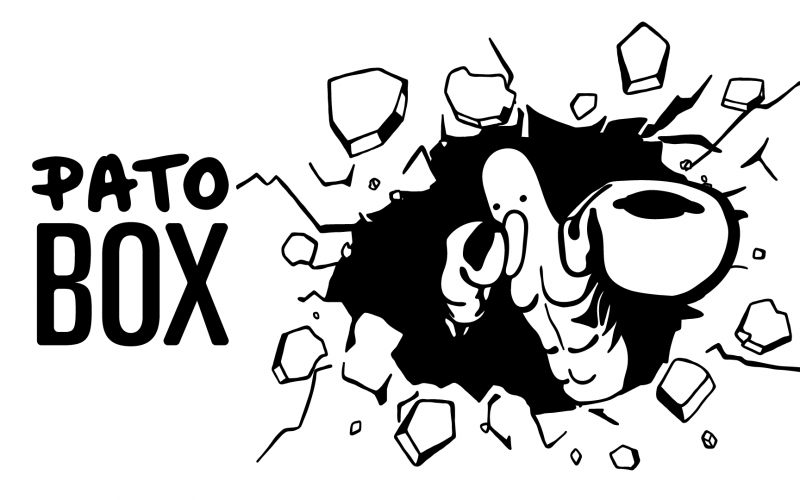 Patobox is punch-out style boxing game with a Mad World-like art style. You play as Primo, the boxing champion who has been cheated out of his championship and left for dead by the Deathflock corporation. The game follows Patobox’s adventure as he makes his way to the Deathflock headquarters to uncovers the sinister motives behind the company and the reason they decided to betray him. There are 2 main sides of the game: The exploring sections and the boxing boss fights. As you play through the story mode you will play both ways, with the exploration sections serving as your adventure styled progression and the boxing aspect being present in the boss fights. Perhaps the reason most people will play the game is because of the punch-out styled boss fights, however I found that the exploring aspect was a very pleasant and unexpected surprise. The game takes place in the Deathflock headquarters, where you are free to roam the building in a 3rd person 3D style of exploration. 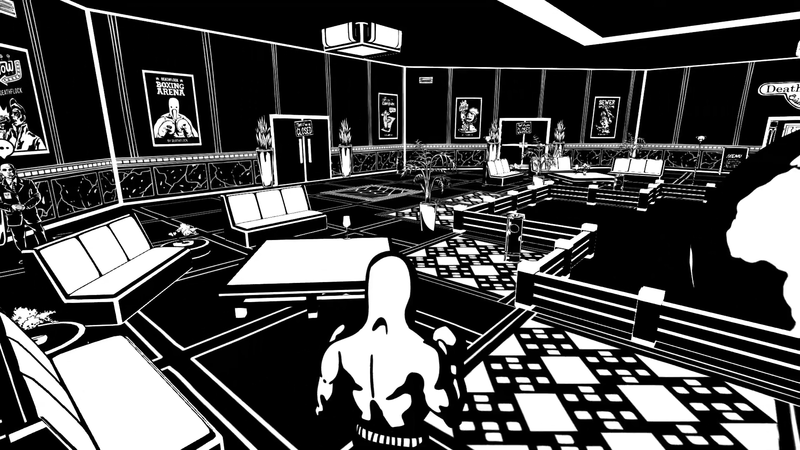 One of the standout aspect of the game is its black and white art style, and I gotta say it truly is a delight to explore every zone in the game. My favorite part of the exploration segments is how they were each separated into floors of the building. Each floor is its own level and is themed behind the particular boss of the area. The levels have their own gimmicks and puzzles that must be solved. 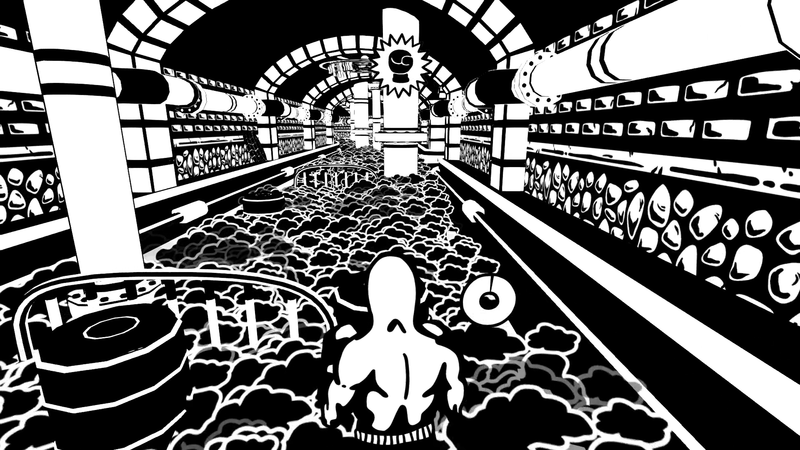 The sewer level, for instance, is full of toxic gasses where you must navigate without losing your breath, while trying to enable the ventilation. While exploring, you will also encounter several notes that give you tips to beat the boss and also fragments of the boss’ past which will shed some light as to how they became elite members of Deathflock. I really enjoyed uncovering the dark past of each of the bosses. They are as varied as you would expect from a boss-centric game. 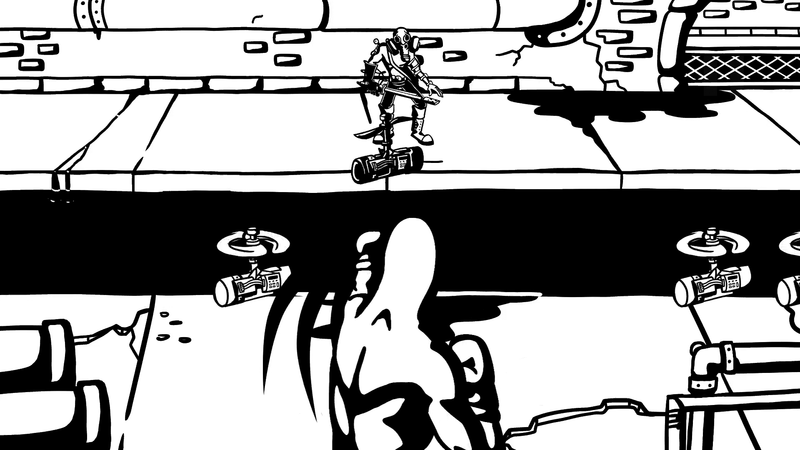 It makes the imminent boss fight all the more epic, because know you know who is on the other side of the ring and the clash of passions that is about to unfold. It is pretty cool to see a game that pays proper respect to the bosses and creates a truly hype battle at the end of each level. And oh boy, are those fights epic! The fighting controls themselves are nothing special, and in fact are exactly what you would expect from a punch-out game. You can do left and right, high and low combinations of punches. You can dodge left or right and press down to block. That’s it, exactly the same control scheme used in the punch-out games sans the powered up punches. The true excitement of the boss battles comes from the variety of the enemy attacks. Using the sewers once again as an example (because I already spoiled you this level and wouldn’t want to reveal much about the others), the boss Vorutki will use different attacks based on explosives and heavy weaponry. It all ties up with his tragic past about the nuclear tragedy of his hometown of Ukrainobyl. But my single favorite moment of each fight comes at the third round. All bosses go through 3 phases, with a transition marked by a slow-mo punch and a zoomed in camera. 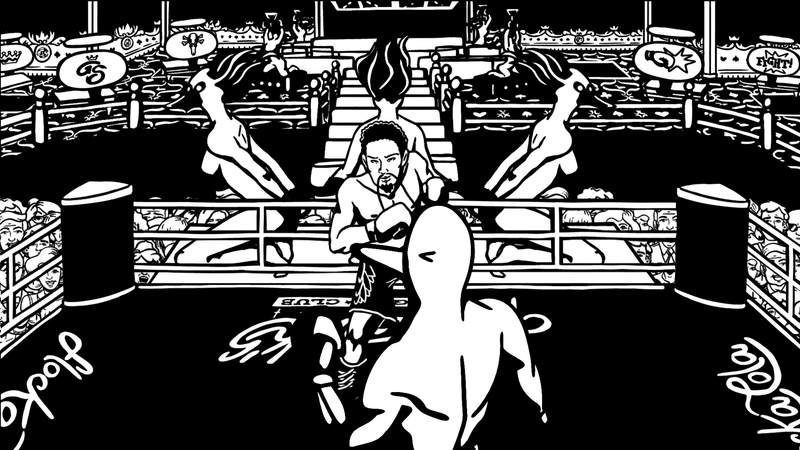 When you reach the 3rd phase, the background of the arena rapidly flashes into a boxing ring. It bring the action up a notch and perfectly ties up with Primo and his boxing career. I guess I might be fanboying on this one, but I truly feel my blood pumping when the boxing ring appears, it transports you to a real match and a place that Primo truly calls home. As an extra note, you can also play using motion controls with the joy-cons in thumbs up grip. The motions are pretty accurate, but the game is hard enough to put an extra handicap on myself with the motion controls. Your mileage may vary, but I prefer the accuracy of a controller. Aside from the story mode, you can play the Arcade mode which lets you play against each individual boss. You can also run a boss rush gauntlet and fight all of them. I encourage you to do so, because there might be something special at the end of your journey, but you will only find out once you do it! I don’t think I can say enough good things about the game. I came for the punch-out fights and the art style, but I fell in love with the world and found myself roaming the headquarters more than I should have to appreciate all the details and listen to the thoughts of the people. It helps a lot that the game is littered with small jokes and humor on every single hallway. I will say that I am a huge boss fight lover, and that is the reason I’ve truly loved games like Dark Souls. With that being said, I found myself perfectly at home with Patobox. I love this game.